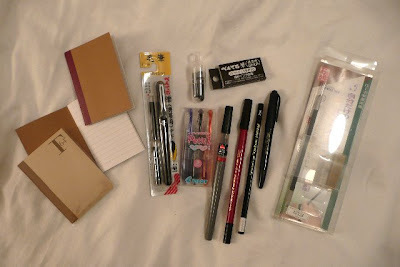 This is my new haul from Kinokuniya opposite Bryant Park in NYC. I first went when it was suggested by Maria at the Altpick and it happens also to be round the corner from Bernstein & Andriulli's office. Very handy. - 3 x 2"x3" narrow-lined notebooks with manila and GOLD - yes gold - covers. Back pocket/handbag stuff. - 1 x Pentel calligraphy brush with two spare black cartridges, with bubble of three spares. - Set of three very cute BUT surprisingly robust mini-fountain pens with spare carts. In blue, orange and black. Am drawing with the black one tonight. - Refillable calligraphy brush pen (fat) - GREAT not to have to chuck it out when it's done! - Double-ended calligraphy brush; narrow stubby end for fine detail and fat end for more 'confident' strokes. - Bog standard 2H pencil. The Bs are hard to rub out before scanning. - Lovely stubby biro-like calligraphy brush pen. Has a sneakily disguised marker end with a VERY fine but firm brush tip. Exquisite. - A tool to carve your own stamp from stone. Includes two stones. Looks sharp and scary and all the instructions are in Japanese so, wish me luck with that one. Includes rub-down Arabic letters in upper and lower case Helvetica and an unknown Third Reich-style font. Also Edward Gorey's never-filmed script for The Black Doll, in hardback. Can't wait. I'm likely to go back before leaving NY so get your orders in now!